We agree with pinner Jamie Anderson: We want! This would look great in our Catio. Oh wait. We don't have a Catio. Yet. Rafflecopter has spoken, and the winner is a new friend, who found us through Facebook. Please say hello to Livivua C. Chandler - and congratulate her for winning! Indeed... a home outside of home! That's super cool. Gees, we'd love that for our little garden! The cat condo is brilliant. Have a fabulous Friday. What a super cool looking cat condo! That is a really cute outdoor cat condo. I want one, too! ....and yeah, that condo would be PAWSOME in our catio that we DON'T HAVE either. Man, that is some cat condo! We wish WE had a catio, too (but we DON'T ... helllllllooo, humans ...). The Staff says she will move in there herself!!! Wow, that is SOME condo! 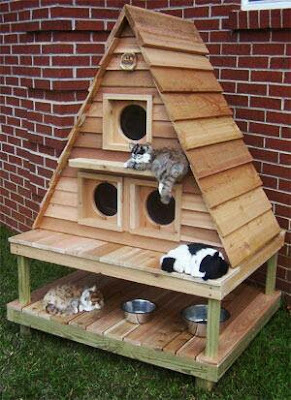 It would be worth building a catio just to have that condo! That's a pawesome condo. I agree, this would be fantastic indoors!